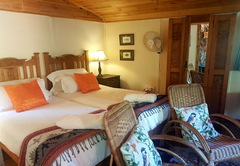 Bonnievale River Lodge is a highly recommended property providing self catering in Bonnievale for tourists visiting the Breede River Valley region. 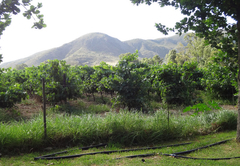 Located in the heart of the beautiful Robertson Wine Valley, Bonnievale River Lodge is surrounded by farm lands. The lodge offers a rural experience that is not far from civilization and the wonders that this area has to offer. 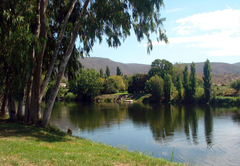 We offer stylish, self catering accommodation and camp sites alongside the Breede River. All sites have electricity and there are hot water ablutions and a communal kitchen. 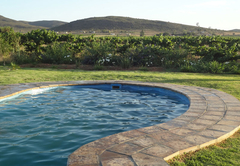 There is a beautiful swimming pool set in the vineyard which is available for all guests to use and enjoy. This 2 sleeper wooden cabin is approximately 20 meters form the river and sleeps 2 in single beds. There is also a camp bed available for 1 child. 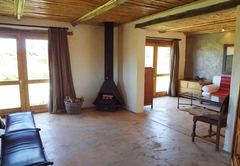 The cabin boasts and ensuite bathroom, fully equipped kitchen, small garden and a private braai / bbq area. 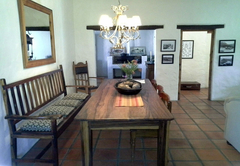 This semi self catering room sleeps 2 and offers braai/barbeque facilities and DStv. The suite can be stocked with breakfast items on request at an additional charge. With spectacular views of the vineyards, this big, fully equipped self catering suite sleeps 2 adults in a queen size bed and a child on a camp bed. There is an indoor fireplace, braai area and DStv. From here you are a mere 40 meters form the river. 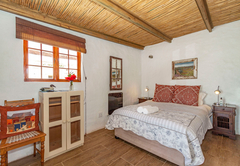 This 1 bedroom suite is connected to the farmhouse and has its own separate entrance. 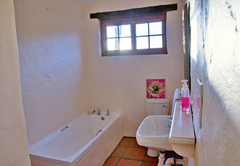 The large suite has an en-suite bathroom and doors that lead out onto a patio area with a braai. There is DStv. 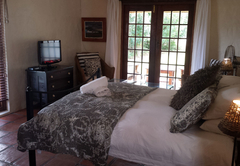 The suite is on a bed only basis and is only self catering when taken with the Farmhouse. The two bedrooms sleep 2 adults and 2 children. 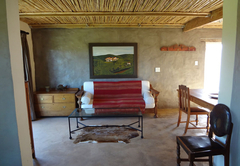 Ther is one bathroom, a fully equipped kitchen, cosy fireplace and DStv. These spectacular riverfront camp sites take both caravans and tents. Although you may drive to the site to unload, there is no car parking permitted on the sites. There is however a car park 30 meters away from the sites. These riverfront sites are for tents only. You are permitted to set upo 1 large tent or two small tents per site as well as a trailer. Although you may drive to the site to unload, there is no car parking permitted on the sites. There is however a car park 30 meters away from the sites. These sites allow for tents or trailer tents only. Although you may drive to the site to unload, there is no car parking permitted on the sites. There is however a car park 30 meters away from the sites. These 11 Camp sites offer wooden decks and spectacular river views. Each site allows for either 1 caravan or 1 large tent or 2 small tents. One vehicle is permitted per site. There is a lot to do at the lodge; enjoy fishing, swimming in the river, bird watching or just chilling under the trees. Feel free to bring canoes, tubes, lilos or anything that floats and meander your way down the river. There are lots of fish in the river and fishing is purely on a catch and release basis. Bass, Carp and Barbel are the predominant fish. A lightweight medium size rod with a mixture of lures, earthworms and mielie bomb would be a good start. We are situated 3kms from Bonnievale town centre in the direction of Robertson, 200kms from Cape Town, 230kms from George. Surrounded by farms and vineyards, we are perfectly positioned to explore the Robertson Wine Route and the Route 62 region. There is a lot to do in the area: wine tasting, 4x4 trails, hiking and river cruises among others. 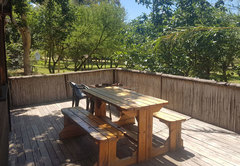 This self-catering farmhouse is elegantly furnished and has an undercover verandah with outdoor seating area and a garden with braai or barbecue facilities. The house has 2 bedrooms and 2 bathrooms and can sleep 5 people. It offers a spacious living area with indoor fireplace and a kitchen equipped with the following; Stove, oven, dishwasher, microwave, fridge/freezer, indoor fireplace. DSTV and wifi is included. Linen and towels are provided. Swimming towels are not provided. 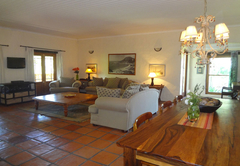 The Farmhouse is close to 3 other suites (Vineyard, West and East) and is about 75m from the river. The West Suite is a spacious suite with a bathroom that includes a bath and shower. ; It has a queen size bed with electric blanket in winter. Small kitchenette that includes a fridge/freezer, 2 plate glass hob, microwave,kettle, toaster,cutlery and crockery. Small outside patio/garden with braai/bbq facilities. DSTV and wifi included. Linen and towels are included but not swimming towels. It is close to the Farmhouse, Vineyard and East Suite and is about 75m from the river. Wood is provided for the first night. The Fisherman's cabin is our glamping option. Well equipped, rustic, wooden cabin. 2 single beds which can be made into a king on request. Kitchenette with fridge/freezer, microwave, stove/oven, kettle and toaster. Inside fireplace for chilly winter nights. Fan for the summer months. 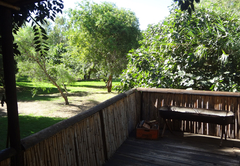 Deck with river views and braai/barbeque facilities. Dstv and wifi included. 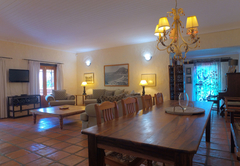 The Vineyard Suite is a spacious suite with French doors leading to a patio, garden and braai/BBQ area. 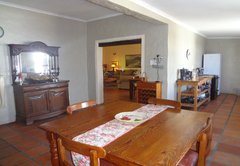 The suite has views of the vineyards and there is a kitchenette fitted with microwave/convection oven, 2 plate glass hob, fridge/freezer, kettle and toaster. 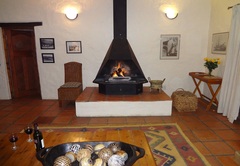 There is an indoor fireplace, sitting area, DSTV and wifi. Linen and towels are provided but swimming towels are not. Wood is provided for your first night and guests have access to a pool. The Vineyard suite is close to the Farmhouse and surrounding suites (West and East) and is about 75m away from the river. The East Suite is a smaller suite with extra length double bed, fridge, microwave, kettle, toaster, cutlery and crockery. 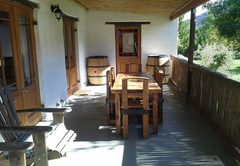 It has a small private courtyard with singe and gas hob as well as braai/bbq facilities. En-suite bathroom with shower. 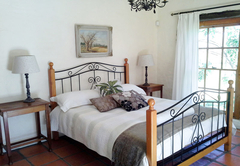 The East Suite is close to the Farmhouse, Vineyard and West Suites and is about 75m from the river. Please note that extra beds cannot be accommodated in this room type. 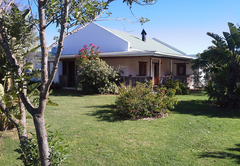 Orchard House is a large house with 2 bedrooms and 2 bathrooms and sleeps 6 people. Stretcher beds can be added for another 2 children to make it work for 2 families with 2 children each. There are 3 courtyard suites with their own bathrooms accross the courtyard which can be added to allow for more guests. 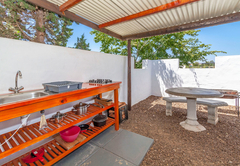 Wrap around undercover stoep with garden and braai/barbeque facilities. Dstv and wifi included. Fully fitted kitchen with all the usual appliances including a dishwasher. Linen and towels are included. Swimming towels are not provided. The river is approximately 80m away from the house. 11 x Upper level camp sites all with electricity and braais or barbeques. Upper level sites have parking facilities. These are elevated with river views. Park sites are in the middle of the upper level and river front sites. They are grassy and most have shade. They too do not have parking facilities but you can drive to your site and unload before parking in the parking area which is about 30-50m away. Park sites have electricity and braai/barbeque facilities. They are approx 20m away from the river. 6 sites on the riverfront. No Caravans. These sites do not have parking facilities, they are drop and go only. All sites have electricity and braais / barbeques. Bring your own grid. The river is wide and usually slow moving unless in the middle of winter or after heavy rains. Fishing is possible from the sites. 2 sites on the riverfront. There are only 2 sites on the river that are big enough for caravans. These sites are drop and go and all cars must be parked in the parking area which is about 30m away. You can drive to the site, unload and then move your vehicle. The sites have electricity and braais/barbeques. Bring your own grid. There is a tap close by. The river is wide and usually slow moving unless in the middle of winter or after heavy rains. Fishing is possible from the sites. We had a lovely stay the river is so beautiful the cottage is fully equipped with all we needed. The place is clean and quiet absolutely relaxing and Lynette the owner is a very lovely lady. Will definitely be visiting again. We have been a few times and always have the BEST time! !